The English Dub MSU-1 patch (supported only by bsnes/higan/sd2snes). This patch enables a full restoration of the original broadcast in CD-quality, dubbed in English! Find the location of the required files and how to set it up in the readme included in the patch folder. The SPC Replacement Map1 patch. This patch replaces the original spc with orchestrated music. 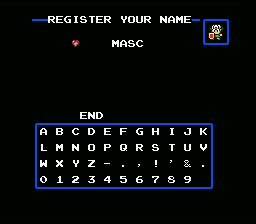 This rom makes the game as original as currently possible. See below what the patches feature! The game begins each week at 07 and the week skip is time related at every 57 minutes. Difficulty: Hard (time limit). If you don't finish the game in time, it is Game Over (but you can still replay week 4 to succeed). - Recommended Add-On: The TQ MSU-1 patch (by PepilloPev/Conn). This patch lets you play Third Quest with CD-quality music! Read more about the Third Quest Project (site also contains single patches). 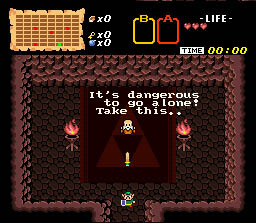 Difficulty: Easy (no timer at all) - the concealed week skip is Triforce related. 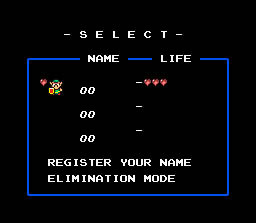 It is recommended to begin with this rom if you play BS Zelda the first time. 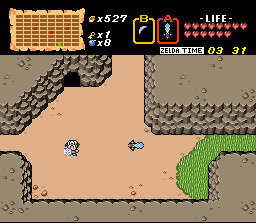 This rom allows you to play BS Zelda with Link and a sword and shield more up to date with Nintendo's latest reinterpretation of them. Difficulty: Medium (Timer, but no limit). 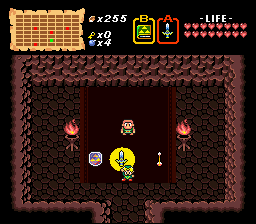 The week skip is Triforce related and you stay in the week you are until you collected both week's triforce pieces. - Works on authentic Real Super Nintendo Hardware! - Title Screen and Story Roll! - Classic feeling Menu System! - Both Map 1 & Map 2 Quests in one rom! - Four full Weeks of 50 minutes playtime! - Playable from Beginning to End! - Different Endings for Success and Failure! 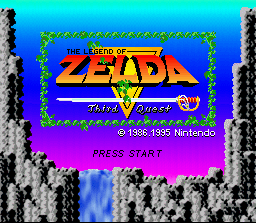 This project is designed to play BS Zelda on Real Hardware, combines both maps and to avoid some emulation problems. This patch is NOT compatible with Roto's, DN's upgrade, Restoration or time patch! The work of MottZilla is a complete alternative project. Read more about the MottZilla Patch Project (site also contains single patches and japanese version). 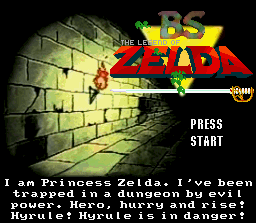 Download the very Original BS-Zelda as it was dumped and put on the web. This game will crash after 57 minutes, but you may mix any patches as you wish. 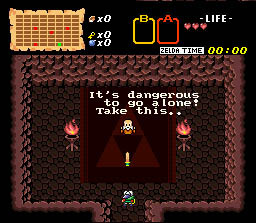 Included are three save states, one to skip the seven minutes wait and two by Roto and Vel to fight Ganon. Apparently the rom above is not the very original dump, but one that is already cracked to work on some emulators. It doesn't really make a difference and we really reccomend the above over this one, but for the records, here is what is regarded as the very original dump in SWC format. Here's the ~very original~ map1 dump of week2 with no alterations at all (provided by sanmaiwashi, posted by Kiddo). This rom is misising some data for the further weeks but is interesting for archieving and research. In short, this patch will fix most of the problems persisting after Roto released his patch. Apply this patch AFTER Roto's patch. Inside the zip file you find a japanese version if you want to play japanese without translation patch. III, As soon you have applied the above patches (I and II) you can choose one of the following styles that you want to play. Do NOT apply one of the following three patches with one other! - Check the subfolder "optional patches" for more optional patches! This patch makes the game closer to the original broadcast. Apply this patch AFTER Roto's Complete and DN's Upgrade patch! Do NOT use this patch together with the TQ-loz or decoration patch below! The translation patch below is required to avoid bugs, unless you patch with the japanese restoration you find in the zip package (requires also japanese upgrade patch version). 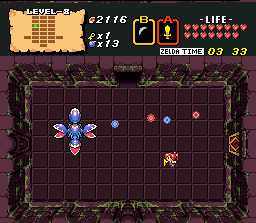 Most of the ingame time related events are stabled, so you can play the game like a regular Legend of Zelda! Check the subfolder in the patch file for single patches! Do NOT use this patch with the restoration patch above or the decoration patch below! Also do NOT apply the English Translation patch from below, it already is translated. Do NOT use this patch with the restoration patch or the TQ-loz patch above! - The English Translation for the game by SmashManiac (07/16/2017). The old translation by Duke Serkol (5/26/00) is also part of the zip file. You can apply the patches to any rom, if you patched it from scratch. The LoZ-TQ has already an own English translation merged. In the zip files of the french, spanish and german translation you find two patches; one for any of the prepatched english roms (Official, TQ, Link version) and one japanese version if you patched from scratch. 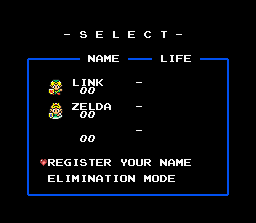 - changes the mascot to Link, also in the menu of Roto's BsZelda Complete and Decoration patch. It's furthermore different from Damodred's as this merely changes the graphics without cracking the timer and Link's sprites are slightly different. Will work also with an unpatched rom. This is an updated version (12/05/2008). Check the subfolder for the old file. If you play with the decoration patch, please apply bslink_deco.ips to change Link as well in the beginning/ending screen and to display the correct ring in the menu. Refer to the readme file to make the best of it. The new version (06/12/2008) features compatibility with the shield patch and the decoration patch. Check the subfolders if you want only one mascot changed. So all crosses get triforces. 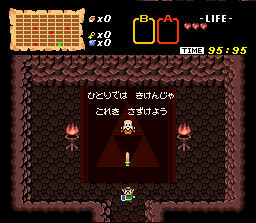 Use triforce_time.ips if you have applied the time patch, otherwise use the triforce_normal.ips. Oh, and the place of the book is of course faked. (don`t use this and FloBBaSKo's patch together). 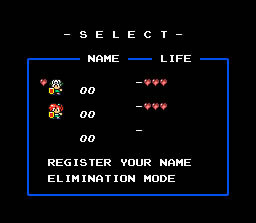 - play as Zelda and rescue Link. - play as the girl mascot. After the first video above, near the end of year 2007, recordings of the whole game were eventually found. Kiddo Cabusses used his YouTube account to upload them so now we can all see how the game would originally play (and most importantly sound, as the videos contain all the soundtrack and voice acting used in the game). They lack the introduction sequence though, so it is reccomended you view first part of the video above before watching these. 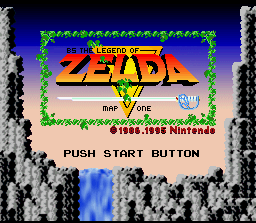 Here you may download a two parts video taken during the original broadcast of BS Zelda, the first part features the introduction of the game that was seen while it was loaded into the BS-X, and the second part shows the actual gameplay for the first week. 1, You'll need an ips exe to patch the rom. 2, Or if ips exe gives you problems you may use Snestools. 3, Or if DOS gives you problems you may use IPS Win. 5, Download here an Editor that Roto made for the game. You may ask Bumpus if you have any questions on its usage. Here you can download the music that we found in the internet which was used in the game (as heard in the video documentary). Thanks to FireBrandX (for remastering some tracks, KiddoCabbusses and joesteve1914 for finding them! Here you can download a txt file with the new Translation. Here's the old Translation from the game. If you finished the game, get this nifty midi of the game's final (obvious spoiler) made by MottZilla. 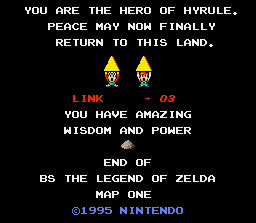 It is the only music NOT remixed from the original Zelda1 (thus made specifically for this game). Genoa, Amazone BT, (my) Con's Handwriting, Lucida Handwriting, Old English and Comic Sans MS! Which person or sword do you want to play with?